It was quite an interesting auction. 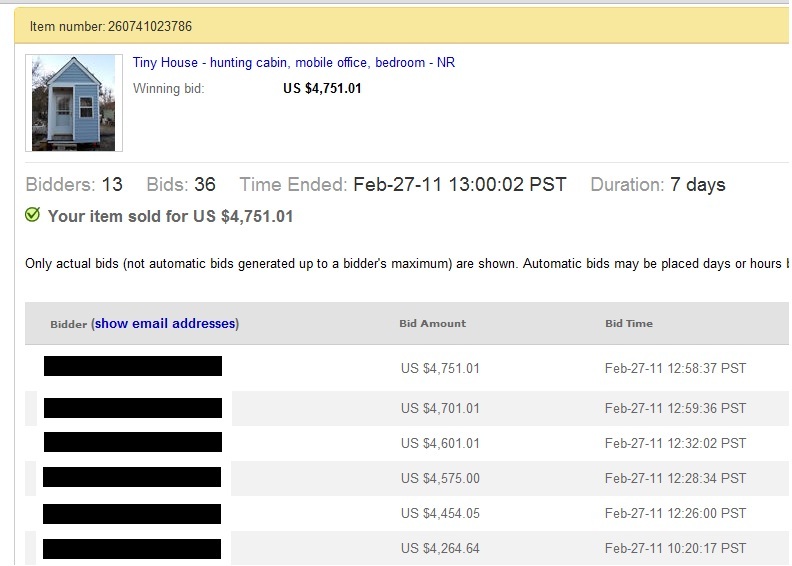 There were over 200 people watching the auction and the end result was within $100 of the auction in January. So it would seem $4,750 was the price. Ebay confirmed it twice. The last hour saw 5 bids from two folks that bumped up the price $500. The deposit has already been paid and now we’re arranging delivery to California. During the week it was listed, three people retracted their bids stating they’d entered the wrong amount. The bids were specific numbers, not that there was an extra zero or something. I guess there’s not an option to put that you just changed your mind. Since I spent over $6,000 building it, you might be wondering how this turned out for me. I think I should recoup the loss as a capital gains loss on next year’s taxes. Plus, I’ve started looking at this as the price of my education in architecture. This was a much better experience (and cheaper) than any year in college could have been. And I’m still anticipating that this project will have been the main factor to have gotten me into graduate school for architecture next fall. I’m waiting to hear back next month. In talking to various interested parties, I’m now of the opinion that the market for tiny houses is in offering plans to do-it-yourselfers. It just seems there are way more people interested in building their own tiny house than in buying an already built one. I figure that’s also how you end up with 200 watchers and 2 bidders in the last full hour of an auction. Or perhaps I just missed the market on the low side of affordability. I really started to question the overall market once I learned that Tumbleweed only builds one house per year but makes a good income selling plans and books. If you’d followed the Tumbleweed newsletters, you would have noticed that last year they weren’t able to sell the one they built. There were a number of announcements regarding hosting it as a vacation rental which is also a great idea. So for now I’m nearing completion of the book that will focus on the nuts and bolts of designing and building a tiny house for DIY folks. Shafer’s book is the gold standard on tiny houses but there’s a lot of stuff that could have been included and I’ll do my best to cover that. This entry was posted in Announcements and tagged tiny house for sale, tiny house plans. Bookmark the permalink. Congrats on the sale. Sad to hear you didn’t recoup the money… but I bet in the end the plans and career will inevitably make up the difference. I’ll keep my fingers crossed for you on that. Thanks, Michael. Yes, I anticipate good things to come. I feel that the bit that I’ve learned through this will hopefully help the tiny house movement continue to learn and grow too. Yes, it’s a shame you took a loss on the house. I think the tiny house movement is still a bit early to embrace many pre-built houses as yet–most of the early adopters seem to want to either do it themselves or have a great deal of input into the finished product. I think that Jay Shafer’s homes are simply too expensive for the market as finished products, while they are very good for those with sufficient building skills who want a really well designed home without the money for labor. If I were in the States still and wanted to build, I’d have to have one on a single level. Due to health issues, a sleeping loft is not practical for me. I suspect that is also true of many who would otherwise be attracted to a tiny house. There is simply no “one size fits all” solution–especially when with so little space there is no room for flexibility–it has to fit to begin with. David, I totally agree. I was just thinking yesterday how one of the advantages of tiny houses is that each house is handmade and can and should be customized to fit the individual. The house & I both arrived in California relatively unscathed. The only construction issue I noticed was the vinyl siding overlaps should all have been to the rear. I duct taped the flapping part & kept rolling. Later I realized I should have stopped at a Wal-Mart or Home Depot and paid them $$ to Pallet Wrap the whole house. That would have prevented any problems from wind / dynamic forces, and kept all the pieces intact. The little flap became irrelevant after I hit a cone in a construction zone near Casa Grande, which pretty much wiped out the siding on that same corner. So – by the time I was out in Quartzite Arizona- with loose/missing siding and not even to the area of wind advisory yet… I went to Plan B.
Riviera KOA campground on the Colorado River has RV storage, which they kindly allowed me to use quoted $20/week. I parked it there, and headed home. I will go back Saturday with my kids, some hardware & tools, fix the siding, and stay at the river for the weekend. *Whew* Enough Relaxing for me- Back to work! Wow, Sandia. That’s crazy. I’d love to see pictures if you get a chance. Hi, Louis. I’d like to have the chance to learning about how to build your tiny houses is amazing. Maria, I’ll probably post more pictures and details later. I’m getting ready to start architecture school at the moment. Hey I totally disagree. I am in love with tiny houses, but I do NOT want to build my own! The thing that is impeding the sale of pre built homes is simply the cost. For example, as much as I love the Tumbleweed homes, they have gotten ridiculously expensive over the years I have followed them. I think the single thing holding it back as a movement is that the works of art made by Jay and crew, (for example), appear clumsy and over the top for the needs of real people. What people need are well built homes of inexpensive LIGHTWEIGHT material, like the new product made by the Sing Corporation. There has to be a middle ground between heavy, (but gorgeous) tongue in grove pine and the prefab stuff soaked in poisons. Annie, what does the Sing Corporation make?